Type II Diabetes is the most common form of Diabetes. In the UK about 90% of adults with Diabetes have Type II. It occurs when the Pancreas doesn’t produce enough insulin, or the body’s cells don’t react to it, known as “insulin resistance.” Insulin is produced by the body to digest the sugars found in carbohydrate rich foods such as pasta, bread, cake, biscuits and sweets. Type II Diabetes is usually treated by making a few simple dietary changes, along with taking more exercise. If you look back over the last decade our diets have changed dramatically. Go back even further – to our grandparents or great grandparents – and the differences become even more obvious. No longer is our diet based on local, seasonal foods cooked in the home. Wholefoods, fruit and vegetables used to make up the majority of the diet, with small amounts of carbohydrates and animal protein. White bread, sweets, cakes, biscuits and other high sugar foods were an occasional treat, rather than a staple part of the diet. Today the local supermarket stocks foods from all over the world regardless of the time of year. Convenience foods take up an increasing amount of shelf space. Refined carbohydrates and sugars now form a mainstay of the diet, along with animal proteins. Ready meals and other convenience foods have become a regular part of many people’s diets. It seems ironic that as cookery programmes take up more and more slots on prime time television, fewer people seem to actually cook their own food at home. At the same time, people have become more sedentary thanks to cars and other labour saving devices both at home and work. If we now go back to Diabetes, it’s easy to say that if the body naturally produces insulin to digest the sugars found in carbohydrates what’s the problem? Surely, if we eat more of them it’ll just naturally produce more insulin as a result? Well, yes and no. Yes, in the short term, the Pancreas will produce more insulin. Our bodies are incredibly resilient and will always try to adapt to the demands placed on them. However, this lulls us into a false sense of security. Unfortunately, over the long term, the Pancreas becomes exhausted and simply can’t keep up with the demands placed on it. And that’s when problems begin. If you’re still sceptical (!) just think about what a typical person in the west eats during the day. For breakfast, a wheat based cereal or toast with jam or marmalade. Mid morning, perhaps a biscuit or muesli bar. Lunch, some kind of sandwich or baguette. Mid afternoon, more biscuits – or cake if it’s someone’s birthday at work. Supper based around a carbohydrate staple such as pasta, rice or potatoes. What quickly becomes very obvious is that every meal – or snack – contains sugars and carbohydrates. Breakfast and snacks are also completely based on carbohydrates. And this is without factoring in any “treats” you may have during the day such as sweets, ice cream, fizzy drinks and sugar in tea / coffee. Now you can see the problem, what’s the solution? Well, the solution is simple and involves thinking differently about your food. The problem is that we do most routine things on autopilot – and choosing what to eat is no different. Just read the label of everything you pick up before you put it in the trolley this week. That’s it. We bet this isn’t the advice you were expecting! And, if this sounds much too time consuming, we’ve got another much quicker and easier solution – which we came across recently – later on in this post. So, keep reading! What you’ll quickly discover may surprise you. Most pre prepared and convenience foods contain high levels of sugars and refined carbohydrates. It makes them cheaper to produce and taste good. More worryingly, they also trick the body into eating more of them before feeling full, as well as being addictive. This is why we crave sweet foods. And don’t forget that sugar won’t always appear on labels. It comes under many guises including sucrose, syrup, fructose, glucose, inverted sugar, maltodextrin, maltose, fruit juice concentrate, sweetener, raw cane sugar and dextrin. 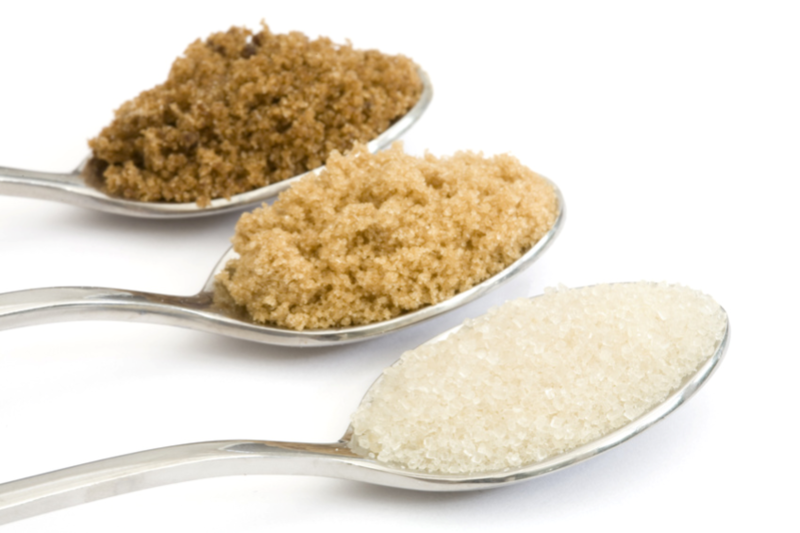 Interestingly, many products badged as “natural” contain as much sugar as their less natural counterparts. Muesli is a good example, with raw cane sugar often appearing as a major ingredient – and sounding so much better for you than sugar. It’s then quite simple. Replace these foods with wholefood alternatives, with the emphasis on fruit and vegetables. For example, porridge instead of sugary breakfast cereals. Multi grain bread in place of white bread or baguette. Fresh or dried fruit instead of biscuits and other snacks. Lunch based around vegetable soup, guacamole, hummus, salad or brown rice. Supper with vegetables or salad as the mainstay and smaller portions of protein and brown rice, wholemeal pasta or potatoes. And don’t forget about snacks and the things you drink during the day. Many canned drinks, even those based on fruit juices, contain high levels of sugar. Artificial sweeteners also need to be mentioned. Don’t be fooled into thinking that you can get round the “sugar problem” by using artificial sweeteners as a substitute! Leaving aside the health concerns linked to them, they can encourage cravings for sweet foods as well as increasing the appetite generally. If this all sounds like too much work, what’s the quick and easy solution you may ask? It’s to only buy foods with less than five ingredients on the label. And that’s it! This will automatically cut out 99.9% of processed and convenience foods leaving wholefoods, fruit and vegetables; with small amounts of animal based protein and dairy products alongside. Does this mean you can’t have the odd treat? Of course not! An odd treat is fine, a treat several times each day isn't. And we all know people who fit into the latter category. By cleaning up your diet your body gets what it actually needs, rather than what your head thinks it needs (!). Whether you are concerned about Diabetes or not, switching your diet over to one based on wholefoods is just what your body needs. So why not try the label challenge for your next shop? The results may surprise you!